It’s that Group Buy time of year again! 7 Bonus Product Tokens which can be used to choose a product from the back Catalogue. Over 50 Products to choose from. Even if you don’t use Kontakt the Group Buy is worthwhile to get this rare opportunity to get 5 products for $19.99. A Synthesizer based on Cycling Waveforms per step including an Advanced Arpeggiator. See Below for full details. You can select from a list of 56 available products from the site, only a few are excluded, mainly ones that were released in the last few months. See a list of ALL available choices. You can select from a list of most available products from the site. A Selection of 700 Bass Loops recorded using a Fender Squier PJ Bass, and a Revelation PJ Bass. NEW: Mosaic has been developed as a front end to the samples, it is along the lines of Reanimator but has many unique features including the ability to automate all Knobs in the DAW. What was previously know as Loop Chainer is now finished and has been renamed to Magic Thread. It has 12 Patterns and 12 Variations which can be triggered via 2 Octaves of midi note triggers. A variation is a set of all the red titled sliders which can transform the sound in radical ways. It's a powerful machine and having the separation of sound parameters and patterns leads to almost endless creative possibilities. The Bass Loops are joined with Reanimator to create an interesting Loop Mangler. This is probably the strangest Reanimator offshoot yet, it doesn’t really sound like Bass often. Using the engines from Mosaic and Magic Thread, these 2 instruments use the Synth Loops from Reanimator for Sequencing goodness. Succession FM uses the Sequencing engine from Procession Advanced and integrates 4 internal Synthesizers for Multi-Timbral operation. Each sequencer can target any or all of the Synths bringing lots of Flexibility. It's also capable of Wave Sequencing. 3 Sequenced instruments based around an exclusive set of 635 Guitar loops. The Guitar sounds includes 2 Banks made with a customized Fretless guitar, many using an E-Bow. Each sequencer remixes and mangles the loops in different creative ways. Advanced midi ARP using 6 Sequencers for Velocity/Trigger and 12 patterns. Many modes are included including Chord Mode. Each Pattern contains all Parameters. It has an extensive randomization system as well as a Remix function. This will be a Drum Machine engine probably along the lines of Black Magic to some degree. I haven’t thought about it too much yet and it’s last because it will be the longest job in the Group Buy. It will be Electronic Drum Based. The initial idea behind Circular was to have oscillators which would play a different Waveform per Step. It turned out to be interesting, but I found that it needed something else to contrast the effect. After much experimentation with various ideas I opted for a Pluck Oscillator and a Swell/Fade In Oscillator which gave some much needed consistency to the rotating Waveforms of the main two Synths. I initially tried them with the same Filter and Mods, but in end decided to go along the lines of pre-filter digital synths from the 80s which rely on the actual waveforms brightness. I think this works great whilst the main two synth take care of the busy and complex sounds. 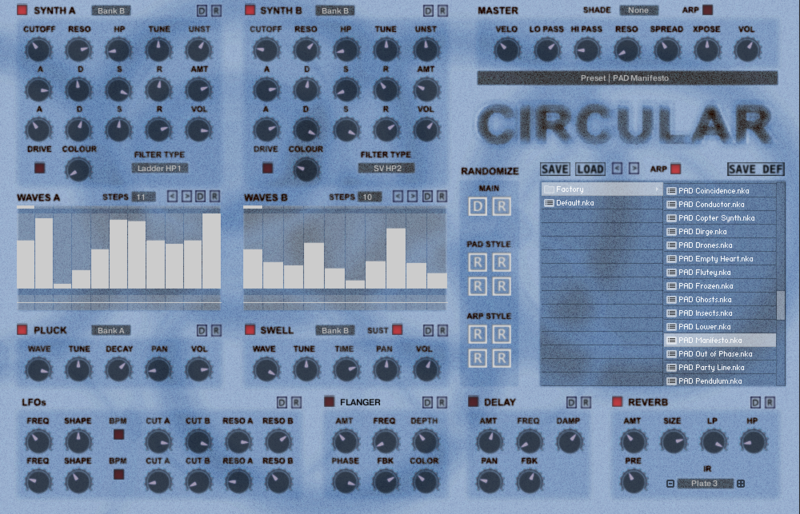 Circular ArpThe Synth has no Panels and so everything can always be seen which makes editing easy and intuitive. However I thought that it’s a shame to not have any sort of Sequencing as it’s interesting with the Wave Cycling, and so decided to make an Arpeggiator in a different Script slot. It’s an Advanced ARP with dedicated Sequencers for Velocity/Play, Note Length as well as both Cutoff and Resonances of Circular. Although it is a separate Script, the main Circular Preset system is used to store the ARP preset too, so that a complete Preset can be used. However there is also a Browser for the ARP which will just load the ARP portion of the Preset without changing the sound of Circular. Last edited by Astralp on Sun Mar 31, 2019 10:54 pm, edited 31 times in total. Last year it was really fun and fruitful! Last edited by martinjuenke on Tue Dec 04, 2018 12:18 am, edited 1 time in total. So much happening over here! Great time again, I love these group buys . And the instruments really grow, maybe its just my personal taste but for me Circular is by far the best and "shaped" sounding one so far. You can get very "interesting" sounds out of evry of the great synths with unique idea behind evry one so far but I ever have problems to really get them to fit into my songideas but Circular really sounds "round", fits perfectly without much tweaking. And the random buttons deliver great results. Great one, alone worth the price, but whats more important the fun of the groupbuy will be "priceless" again . Only one request: after all these groupbuys there is really not much left to choose from existing products . So would be great if you could think about to throw in some of the excluded ones (like the Air ones, Gravity) on higher level (for example for level 11) ? I have 1/2 of the Bass loops processed now, should be ready to work on ReaniBass in the next few days. Current Level is 1, Circular and a Bonus Product selection already available. I used my bonus credit to get Movement, that and Circular for $19.99 is good even if no-one else joins. Um, silly q - how do I access the bonus? Michael Parkinson - on the Group Buy Page there is a link just below the current member stats in the box on the right. 15 to the next free product. Group Buy you say? Of course I'm in! I'm in again for this new great Group Buy of GEMs. Cheers!